Remember when we were kids and we sat in front of the TV to watch The Muppet Show? There was unlimited family-friendly fun, with catchy songs and snappy one-liners. 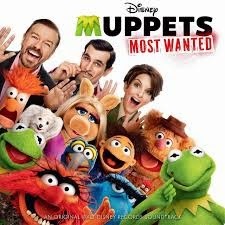 This Muppet sequel, The Muppets Most Wanted, has all of those memories and a fun plot that is great for kids with lots of laughs for their adult drivers. Constantine, the world most dangerous frog, (voiced by Eric Jacobson) has escaped prison in Siberia and with the help from his number two, Dominic Badguy (Ricky Gervais), sets up our hero Kermit. Kermit is sent to the Siberian prison because he is thought to be Constanine “It’s not easy being mean” Frog, where his warden is Nadya, played by Tina Fay. She doesn’t care that Kermit isn’t really Constantine, she’s infatuated with Kurmeet. She asks him to produce the annual prison review show. Meanwhile, no one realized that Kermit was missing. Sure he was acting weird and being very romantic to Miss Piggy who was planning their wedding, even though Kermit hadn’t even proposed to her, but no one truly realizes he’s missing. There is a lot of slapstick comedy and fun, if not predictable, plot twists. There are many cameo appearances by famous actors and music talents. “Where is the Usher?” and he turns around. The singer Usher. I laughed, not sure if anyone else in the theater did. Other cameos were made by Stanley Tucci, Tony Bennett, Danny Trejo, Christoph Waltz, Sean “P. Diddy” Combs and Salma Hayek. The acting was great and I would actually see this movie again when it comes out on DVD. Muppets Most Wanted was a great way to pass an afternoon with the kids. I do recommend this movie to those who want to spend time with the kids on rainy day or sometime when everyone needs to get out of the house.